Latest Find: Vercherites undulatus Brayard Bylund & Jenks 2013. Under Utah Fossil Cephalopods you will see lists of Utah's fossil cephalopods in systematic and biostratigraphic form. There is also a list of references for information on the cephalopods from utahs rocks. Some of the more detailed pages of localities or faunas are linked from there. Under Utah Fossil Cephalopods in Time you will find a geologic time chart with links to the different Systems or Periods, from there, links to stages or biozones showing representative fossils from each stage or biozone can be found. Utah Fossil Cephalopods in Space has a map showing localities where I have found fossil cephalopods, and a few other maps that I am working on. Some Large Ammonites from Utah has pictures of the large (over 10", 250mm) I have found. 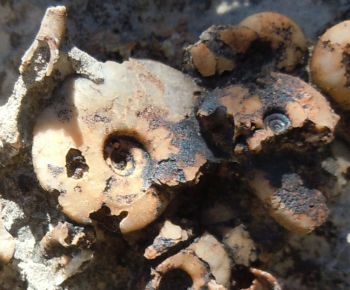 A few of the localities I find fossils at are shown in Some Fossil Cephalopod Bearing Rocks.